Out now from Titan Books. 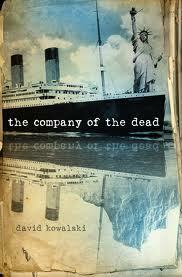 To celebrate the release today of the fiction debut and launch of his epic book in time for the 100th anniversary of the sinking of the Titanic, author David J. Kowalski has dropped by to Books and Writers to reveal some his favourite conspiracy theories. Can one man save the Titanic? March 1912. A mysterious man appears aboard the Titanic on its doomed voyage, his mission to save the ship. The result of his efforts is a world where the United States never entered World War One, thus launching the secret history of the 20th century. April 2012. Joseph Kennedy, grand-nephew to John F. Kennedy, lives in an America occupied on the East Coast by the Germans and on the West Coast by the Japanese. He is one of six people who can restore history to its rightful order – – even though it may mean his own death. It’s said that if you accept one conspiracy, you’re more likely to accept others. It’s also said that people who accept one conspiracy are more likely to accept others, even if they are contradictory. Some records suggest that the Titanic set off from Southampton with a fire in Coal Bunker 6. Such fires were common aboard coal-fired ships. The theory is that the constant heat may have weakened the ship’s bulkhead making it vulnerable to any icy encounters. The other suggestion is that the ship itself was a floating time-bomb while the fire raged. There is no evidence that any sarcophogus was ever shipped aboard the Titanic, but for quite a while it was suggested that the mummy of a priestess of Amen-Ra, wreaked her final curse on April 14, 1912. This mummy, whose lid is currently displayed in the British Museum, as opposed to the Atlantic floor, caused a lot of trouble for its various owners. Allegedly purchased by William Stead, a self-styled mystic who makes his own dire predictions in The Company of the Dead, it was supposedly smuggled aboard the ocean liner the night before her departure. Matt Forbeck’s Carpathia has vampires roaming through the wreckage of the Titanic. (Can’t wait to read it.) I am hanging out for a tale regarding a mummy shambling through the sinking ship. In Company, the results of 1912 lead to a different outcome of the First World War. The proximity of that event, with the sinking, led some people to theorise that the Titanic’s sinking was no accident at all. They propose that the German navy, wanting to test their new U-boat designs, took a shot at the Titanic as it safely nudged its way past the iceberg. I read Gardiner’s book, while preparing my own. The theories are a stretch, but well outlined. He examines several events and coincidences that occurred in the months, days, and hours leading up to the sinking of the Titanic. His conclusion, the Titanic never sank. It was her sister ship, the Olympic, already damaged from a previous collision but terribly expensive to repair as the Royal navy wouldn’t pay up, that was scuttled in the ultimate insurance scam. 5. The world will live in is the result of a time travelers intervention aboard the ship. This is my own contribution. And the details of this little theory can be found elsewhere. Granted, it’s a little wilder that the idea of a coal fire, or rabid U-boats. It lacks the mystique of a Mummy’s rampage and the nasty manipulation of evil businessmen in the White Star Line. But I guarantee you. It’s the truth. Possibly. Thanks to David for dropping by. Now go seek out this great alternative history of what may or may not have happened to Titanic and what may or may not happen in April 2012.